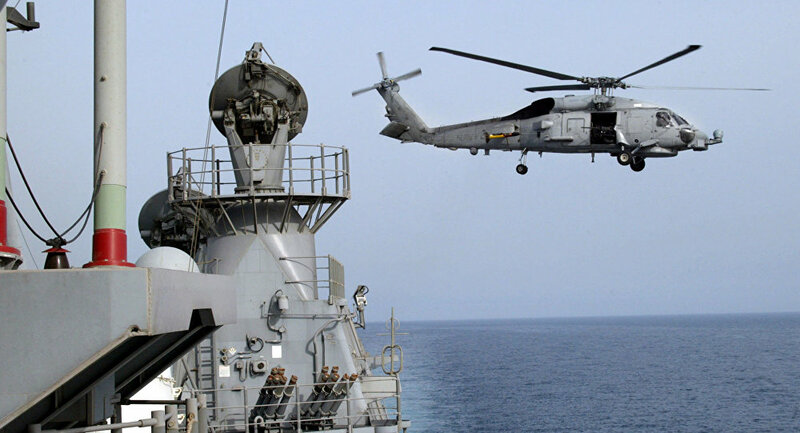 The Iranian military contends the US military presence in the Persian Gulf is opening up the potential for conflict in the region, after an Iranian vessel pointed a weapon at a Navy helicopter over the weekend. On Monday, US Defense officials announced that an Iranian vessel, operated by Iran's Revolutionary Guard Corps, had pointed a weapon at the helicopter as it flew over international waters in the Strait of Hormuz. Washington called the incident “unsafe and unprofessional,” as well as “provocative,” but Iran has a different take on the situation. "Everybody knows that the main problem in the Persian Gulf is the U.S. presence," an unidentified official in the Revolutionary Guards told the Tasnim news agency. The official further accused the US of making false allegations against Iran, calling the behavior “improper and unprofessional.” He did not directly address the issue of the vessel pointing a weapon at the helicopter, however. The unnamed US officials who spoke to Reuters on Monday stated that those on the aircraft did not feel threatened by being in the line of fire. The officials noted that if they had felt threatened, they could have been lead to retaliate, making the actions by those aboard the Iranian vessel extremely dangerous. Iran has previously threatened to block access to the the Strait of Hormuz in times of conflict, but has never acted on it. The strait is the home to approximately 40% of the world's oil tanker traffic. During his campaign, president-elect Donald Trump vowed that Iranian vessels would be “shot out of the water” if they harassed the US Navy in the Gulf.